The first day at the Ranchstyle in Grand Junction was pretty chill. There was a ton of riding and some clinics- after wards, some beer was drank, and there were bikes, ridden with a bunch of bros. When I was riding, I spent most of my time at this sweet ravine where some of the signature features of the Ranch are located. 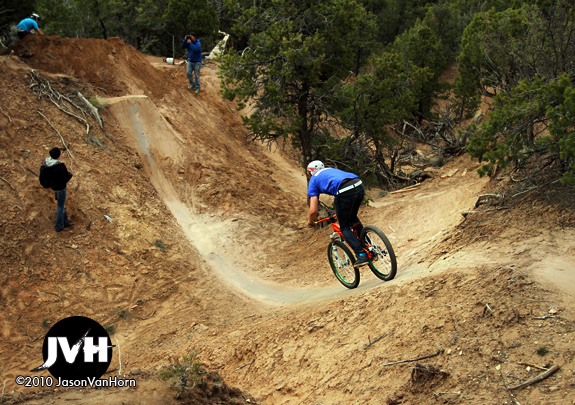 There are two lines in the ravine: a drop to two hips, and a line into one of the most fun jumps I’ve ever ridden; a sick-as-hell step-up. Mike Metzger flies, like Clark Kent can. The landing of the step-up was intentionally soft, and left uncompacted. Combined with a massive take off ramp, (with a steep face) the kicker sent you almost straight up, and offered a moment of weightlessness that was extremely conducive to trying new tricks. Many new tricks were attempted by those in attendance, with many bails, but the soft landing minimized almost all the crashes. I’ve wanted to build a jump like this for a long time. Now I’m seriously fired up. 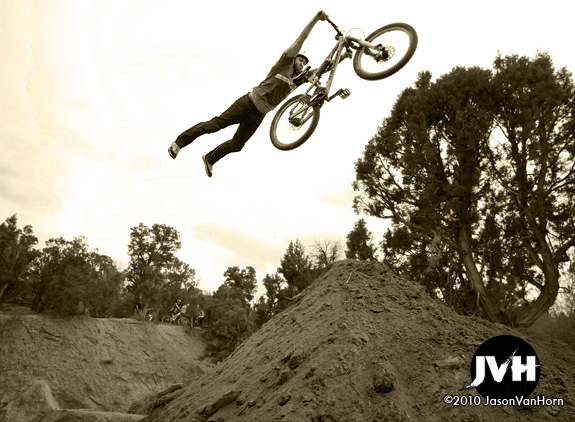 Not just to build a sweet jump, but to also build up a dedicated short travel slope style bike. All of a sudden my quiver needs to have one. The all mountain bike doesn’t cut it anymore for this stuff- every time I dropped into the chute, (pictured above) my suspension totally gee-d out. (even after adding a ton of air pressure) Maybe I’m getting old, but the hard tail felt under gunned on the face of a jump that was much higher than my head.